The Fellowes 225Ci is a 3.9x38mm Cross Cut shredder and is ideal for commercial use in a Small Office for up to 5 users. The machine can shred up to 20 sheets per pass into 3.9x38mm cross cut particles. To save energy, the shredding system reduces in-use energy consumption and powers down after 2 minutes of inactivity. 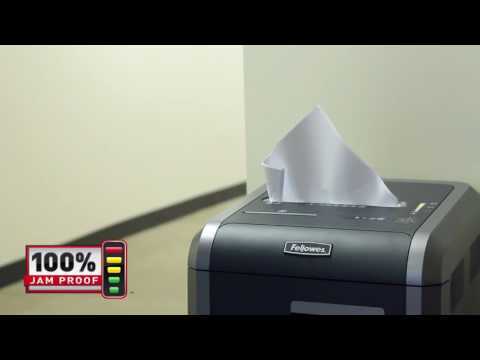 The Fellowes 225Ci uses patented SafeSense® technology, which automatically stops the shredder when touched and uses a 100% Jam Proof System which prevents the machine from jamming, as well as self-correcting when paper is not fed in properly. Advanced features include an Auto-start and reverse function to maximise ease of use and a large 60 litre pull-out waste basket for easy emptying of shredded waste. There is a separate throat and waste bin for CD's/DVD's which allows waste to be segregated for recycling. The Fellowes 225Ci also features SilentShred™ to minimise office disruption, a Continuous Duty Motor which ensures the shredder is always ready for use, castors complete with brakes for mobility and a cable tidy at the rear. The machine will also shred staples, credit cards, paperclips and CD's/DVD's. As well as the shredder, power cable and product manual, the box contains a free 355ml starter bottle of shredder oil & a pack of 5 waste sacks. Please note that the shredder oil will last approximately 1 week and so it is recommended that you order more to keep your shredder running at full capacity. The use of a P-4 shredder such as the Powershred 225Ci will aid your GDPR compliance. This shredder prevents paper jams by displaying a visual indicator if you try to shred too much paper. It will also power through misfeeds.